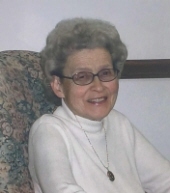 ANNA G. WHEAT, 93, of Prophetstown, IL, died Sunday, February 5, 2017, at Prophets Riverview Good Samaritan Center in Prophetstown. Anna was born September 19, 1923, in rural Prophetstown, the daughter of Swedish immigrants, Alphonse and Hulda (Gustafson) Hvalgren. Anna graduated from Prophetstown High School and Moline Business College. She married Arden Bus H. Wheat on September 20, 1946 in the Moline Lutheran Church. Bus preceded her in death on October 8, 1978. She worked for Farm Bureau in the Quad Cities. Anna and Bus owned Wheats Cleaners, a dry cleaning and mercantile store, in Prophetstown. They purchased the family farm in 1959 and Anna began her 30 year career as a cost accountant for Penberthy. She also did the accounting for Portland school. She was a member of the First Lutheran Church where she volunteered her time. Anna was a member of the Nature Area Guardians and enjoyed gardening, traveling, and bird watching. She delivered Meals on Wheels and helped in the beauty shop at Good Samaritan. Anna was a devoted Mother, Grandmother, and Aunt. Survivors include her daughter, Linda (Lyle) Klooster of Erie, IL; her son, Dennis Wheat of Prophetstown; grandson-in-law, Joe Wanderling of Brookfield, IL; and two sisters, Lillian (Dwight) Parker of Prophetstown and Edith Wah of San Antonio, TX. She was preceded in death by her husband, Bus; her parents, Alphonse and Hulda, her in-laws; Dale and Jeannette (Rumler) Wheat; her brother-in-law, Dr. Thein Wah, and two granddaughters, Sherry (Klooster) Wandering and Kimberly Klooster.